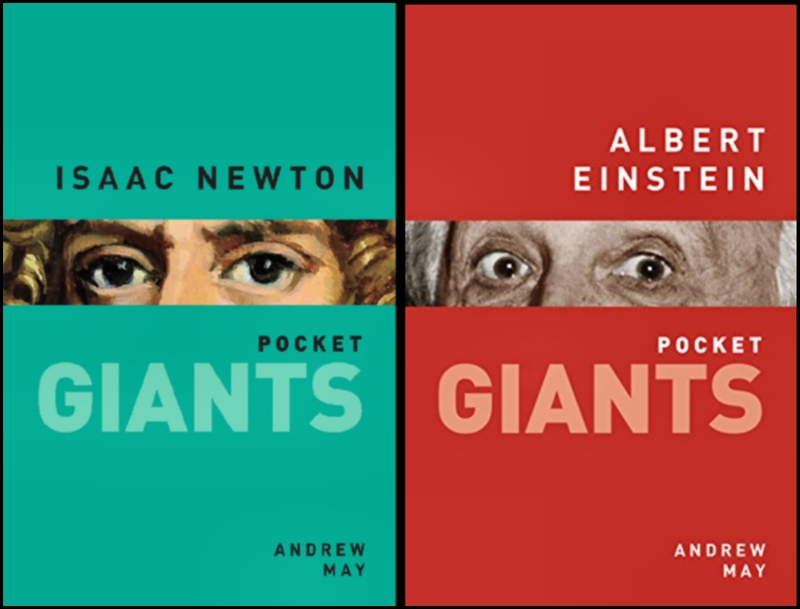 Devotees of Isaac Newton and/or Albert Einstein have got several new books to look forward to this year. 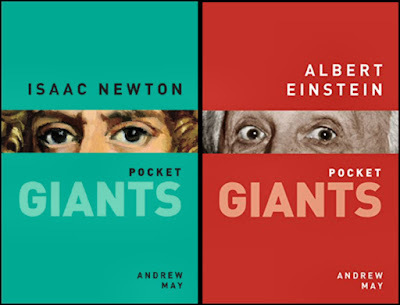 June 2016 sees the U.S. version of Isaac Newton: Pocket Giants (the British edition of which was published last year). The companion volume on Einstein (pictured above, alongside Newton) is scheduled for March in the UK and August in America. In a different series, 30-Second Newton is due out in February, with 30-Second Einstein following a few months later (no exact date yet). Both these books are edited by Brian Clegg, with contributions from several authors including myself. Einstein and Newton are two of the most famous scientists who ever lived. They were both theoretical physicists, who came up with new models of the physical world using mathematical equations. So did many other people, but Newton and Einstein are pretty much the only ones that non-scientists have heard of. There was a TV documentary last month about James Clerk Maxwell, which started from the premise that hardly anyone has heard of him (including people interviewed in the shadow of his statue in Edinburgh). Yet Maxwell formulated the fundamental equations of electricity and magnetism, just as Newton had done for gravity, and Einstein (an admirer of both Newton and Maxwell) was to do for space and time. Maxwell’s obscurity simply emphasizes the obvious – that most people don’t give a toss about the fundamental equations of anything. Both Newton and Einstein did other things besides science. Newton put at least as much effort into alchemical research and Biblical analysis as he did into physics, and most of his time after the age of 50 was devoted to administrative work at the Royal Mint. Einstein is almost as well known for his pronouncements on politics, pacifism and philosophy as for his scientific work. Personally I find these extracurricular activities just as fascinating as the mainstream ones. My contributions to 30-Second Newton include entries on Newton’s Theology, Biblical Science and the Royal Mint as well as subjects like Tides, Comets and the Reflecting Telescope. For 30-Second Einstein, I contributed items on Einstein’s pacifism and his letter to President Roosevelt about the atom bomb, as well as observational tests of relativity and similar topics. 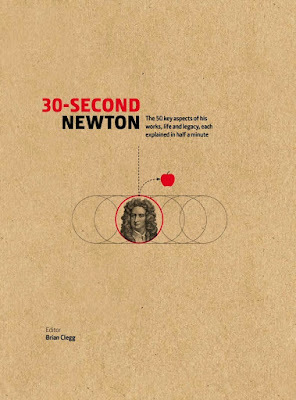 I should stress that these “30-Second” books are really excellent, despite the rather glib title and unspectacular packaging (the cover of the Newton book is shown below). I’ve worked on four of them now, all edited by Brian Clegg. Besides the Newton and Einstein titles, there was 30-Second Quantum Theory, which appeared last summer, and 30-Second Physics due out next month. The contents in all cases is absolutely first rate, with none of the dumbing down you might expect from the “30-Second” title. And the copious internal illustrations are much more striking and informative than the cover. You can see some sample pages from 30-Second Physics here and from 30-Second Newton here (first click on the small grey squares to get the appropriate thumbnail, then click the thumbnail for an image large enough to read). The last of the Newton samples is my piece about Comets. Thanks Colin. There may be a difference between Britain (where I think most people associate Newton with gravity and the falling apple) and the US where he is more obscure. The American equivalent of Newton would be Benjamin Franklin - the incident with the kite must be known to all US schoolchildren, but far fewer in the UK. 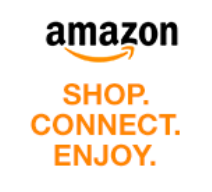 Incidentally, Colin, my Newton book is on Google Play for just 99p, so you really ought to go for it!